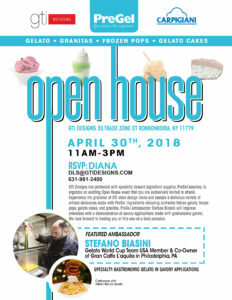 Join GTI Designs in welcoming a company known for being one of the best specialty dessert ingredient suppliers in America. Acknowledged for creating the first semi-finished paste for gelato and sorbetto, Pregel has been established since 1967 giving the world new ways to enhance the flavor and shelf-life of gelato. Witness and taste the work of culinary artist, Ambassador Stefano Biasini. Biasini has been embracing the art of gelato in his own way with his savory gastronomic gelato that has been taking world by storm. So come down this April 30th, 2018 to experience, not only, the splendor that GTI Designs has to offer you and your eatery; but the exquisite delicacies that awaits you.